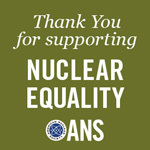 ANS President Dr. Michaele Brady Raap thanked the hundreds of ANS members who made comments on the EPA’s website in November as a result of ANS’s Nuclear Equality grassroots campaign. EPA is reconsidering how it treats nuclear power in its proposed greenhouse gas rule for existing power plants, Administrator Gina McCarthy said a House hearing today. People did not appreciate the way we handled it … so we’re relooking at it on the basis of the comments that came in,” McCarthy after Rep. Adam Kinzinger raised the issue. One part of the proposed rule — focused on increasing zero-carbon power generation — would require states to avoid retirement of about 6 percent of nuclear capacity that is at risk of decommissioning. That means, Kinzinger said, that “for some reason only 6 percent of the existing nuclear is able to be utilized, and that leaves states with no reasonable look towards clean nuclear generation in order to comply” with the rule. McCarthy said EPA’s approach “really was an attempt to recognize the value of nuclear in the current baseload and the danger of not recognizing that they’re competitively challenged.” She said the agency was also noting that a number of baseload nuclear power plants “have not yet committed to permit renewal."